Ms Sandra Heppler has been a trained dental assistant (ZFA) since 2001. In 2011 she decided to continue her education as a dental prophylaxis assistant (ZMP), which Mrs. Heppler successfully completed in 2012. 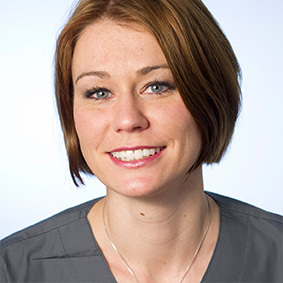 A really good decision – because we would not like to miss Mrs. Heppler in our practice team. Mrs. Heppler, who is responsible for prophylaxis in our team, takes care of the dental health of our patients day after day with great passion and joy. She has intensive expertise in all areas of holistic dental hygiene and knows how to inspire patients with the beautiful necessity of continuous dental care. Cordially, sympathetically and always with a large portion of empathy, she is our contact for all young and old patients when it comes to oral health through prevention and nutritional advice. Mrs. Heppler’s friendly nature effortlessly conjures a smile into the faces of our patients – literally, after all, there is no better confirmation of the success of her work than a satisfied patient’s smile that comes from the heart. Mrs. Heppler lives her passion for education and prevention not only in her practice, but also beyond it. Since 2011, for example, she has been active as a consultant at the Rhineland-Palatinate Youth Dental Care, is a competent contact person for pregnancy counselling, and supervises numerous prophylaxis courses. After all, the cornerstone of lifelong dental health is dental prophylaxis – for young and old alike.